Teacher in Study Lab has a lot of controls and access rights. Below flowchart depicts the various functions of the Instructor. An Instructor is a user who creates the courses, manages the courses and students. An Instructor by default gets access to a lot of features in the sites. Like viewing all Questions in the question bank, viewing all units in the directory through the admin panel. Instructor however can not edit or delete the contents from Units created by other Instructors. An Instructor can not manually assign badges and certificates to students who are not taking the course. An instructor is also the Group Admin of the groups connected to Courses published by him. An Instructor therefore can Add or Remove any student from the Group. An Instructor can also assign some students as Group Moderators for efficient functioning of the group. Just like the groups, an Instructor is the Forum administrator for the Forum Connected to the Course. An Instructor can delete any sub-forum, topic in the Course forum. An Instructor can ban any user in his/her forum. Units are the most basic elements in a course. Follow the steps to create a new unit. Go to LMS section and click on All Units. Unit Description: Enter a small list/description of the unit here. The description comes below the heading of the Unit. Unit Type: Select unit type from General(Simple Text Unit) , Audio, Video or Podcast. Selecting the unit type comes handy in course curriculum where the unit icons are shown based on this selection i.e. in case of a video unit, a video icon will be shown along with the unit name in the course curriculum. Free Unit: Select Free Unit Show or Hide. Show option makes the Unit as free and allow users to see the unit for non logged in users before purchasing the course. Unit Duration: Enter the estimate of the duration of the course in Minutes. Unit Forum: BbPress Forum can be connected to an individual unit from here. Select the Unit forum or Course Forum or any other forum instructor wish to connect with this Unit. Forums are useful for instructor and students interaction, clearing the doubts and creating a social connection within the group opting the course. Unit Attachments are downloadable data attached to a unit which the students can download. These attachments are shown at the bottom of the unit. An attachment could be a video, audio, pdf, doc or a zip file. Follow below steps to add attachments to a unit. Click on Add Media button in the Unit. Unit will now automatically detect the attached files and show them below the unit content. You can save the unit as draft for future releases or Publish it. Question is the most basic elements in a Quiz. Follow the steps to create a new question. Go to LMS section and click on All Questions. Now click on Add New button. Now fill in the reference name of the question like “Maths Quiz1 Question1″ etc, naming your question helps in putting up questions together while making a quiz. After naming, enter the question in the editor area. Question Type: Select question type here. You can select from Multiple Choice (Select one from options), Multiple Correct(There can be multiple answers), Select Drop down, Fill in the blank, Match answers, Sort answers, Small Text(One Word or Sentence), Large Text(Essay Type Questions). Question Options : Enter option by clicking on Add More. You can arrange the order of the options by dragging the small arrow button(in blue) on left hand side of the option number. Correct Answer: For Single/ Multiple choice, enter the correct answer choice number and separated by comma in case of multiple answers. In case of Small Text, enter the full complete answer in the space given. This would help the instructor to evaluate quiz after it is completed and submitted by the student. Quiz is made up of questions. Instructor can place quiz anywhere inside the course, be it after each unit or after the completion of all the units or both. Follow the steps to create a new quiz. Go to LMS section and click on All Quizzes. Now fill in the details like Quiz Name in the heading of the post, and the instructions or any other information like type and questions you want to tell users before they head for the quiz in the editor area. The editor area is same as that for posts, pages and supports WordPress native audio and videos. Quiz Subtitle: Enter a subtitle of the quiz here. The description comes below the Quiz name. Quiz Duration: Select the total duration of the quiz in minutes. The time will set accordingly in the timer. Send notification upon evaluation: Once the quiz has been evaluated by the instructor, if set show it will automatically send message to the students that the quiz has been evaluated and the results are available. Post Quiz Message: The message box appears after the quiz has been completed by the students. Quiz questions: Add the quiz questions here. The question here appears from the All questions that has been created by the instructor. Since the question database is common so the column shows all the questions created by all the instructors. So, it is very important to give a meaningful and identifiable question name while creating a question. Assignments are an integral part of course which represent homework or offline work job which require a longer duration of time in days and are manually evaluated by instructors. Assignments are like questions with timer and upload functionality. The assignments are manually evaluated by instructor. The assignments can be connected to a Unit or an Event. Assignment can also be included in courses for course evaluation, that is when the course is evaluated the cumulative percentage of all the quizzes and assignments will be calculated for auto-eveluate courses. For manual evaluation, assignment marks will be shown along with quiz marks for grading purpose. Now fill in the details like Assignment Name in the heading of the post, and the question of the assignment. The question can include multimedia like images, audio and videos. Assignment sub-title : Enter a sub-title for the assignment. Sub title is an important description text shown below the Assignment title. Sidebar : Select a sidebar which appears below the timer. Assignment Maximum marks : Marks for assignment, required if you’re adding the assignment in a course for evaluation. Assignment Maximum Time limit : Set the maximum time for the assignment timer. The assignment is automatically submitted when the timer expires. Include in course evaluation : If set to yes, assignment marks will be included in course for calculating cumulative percentage based on which badges and certificates are awarded to students. Assignment Submissions : Select a Assignment submissions type. Upload file or text only. Attachment type : If Assignment submission is “upload file” then select permissible attachment types. This is an important setting as it detects the type of file uploaded and secures the upload functionality. This functionality however requires few functions to be installed in the server, if you’ve seen the notification on assignments and you want to use the upload functionality you need to contact your webhost to enable these functions. An Event is an offline activity which occurs at a specific date, time and place. An Event can be global or course sepcific, can be paid or free, can be private or public. Now fill in the details like Event Name in the heading of the post, and the content of the Event. The Event content can include multimedia like images, audio and videos. Event sub-title : Enter a sub-title for the event. Sub title is an important description text shown below the Event title. Course : If Event is a part of a course, connect the event to a course. This event will then be shown in course events calendar. Connect Assignment : Connect an Assignment with the event. If you want to conduct a small test after the event the assignments functionality is perfect for this. It can also be included in course for evaluation purpsoe. Event Icon : Select an Event Icon by clicking on the icon symbol. This icon will represent the event. Event color : Click in the box to select the color for the event. To close the color box, click in the text box again. Show Location : Set to yes to enable location for the event. Location : Drag the pointer in the google map to set the location, it will automatically select the closest matching address, match the information and make changes in if necessary. Additional Information : Useful if you want to add important additional information. This information is shown to right of events description on the top. More information : Show more information about the event. Private Event : If you want to hide event from students then mark the event as private. Associated Product for Event : Connect an Event to a product. To restrict access to this event as a paid event, you need to enable Private Event and add a associated product for the event. So when the product is sold the student gets access to the event. If the connected product is the same as course product then the students having access to the course can access the event. This functionality is useful if you want to sell your events as stand alone event. A course is said to be complete, after units, quizzes are added to it.Follow the steps to create a course. Go to LMS section and click on All Courses. Sidebar: Select the sidebar you want to place in the course page. Sidebars are created in the section Appearance->Widgets by the administrator. Excellence Badge: The badges are given on completion of the course and after achieving a certain percentage in the quiz i.e. the Badge Percentage which can be adjusted in the next setting. It is not necessary that every course taker will get the badge. Badge Percentage: This is the minimum percentage required by the students to have a badge for the course. Badge Title: You can set the title for the badge given after completion of the course like for a Maths course, you can set the title as Maths Champion which a student will get only after receiving the Badge Percentage . Completion Certificate: If set Show, after the course is completed each student who passes the course will get this certificate of completion which is printable as well as downloadable. You can design the certificate according to your requirements.Follow the tutorial in the relevant section.Even after the course has expired the student can log in and view/print/download her certificate of completion. Passing Percentage: The minimum percentage required to pass the course. Total Duration of Course: Total duration of the course is the total time for which the student can access the course by logging into the site. After the duration has expired, the user will not be able to view the course content. Total Number of Students in Course: Initially while creating the course the number of students is set to 0. Course Curriculum: This setting help the instructor to create the curriculum of the course by arranging the units, quiz and categorizing it in sections. Add Section enables the instructor to add a section and name it. Add Unit enables the instructor to add units which has been created earlier. The units can further be arranged under different by dragging and dropping. Add Quiz allows the instructor to add quiz after unit , section or anywhere the instructor wish to place the quiz. All the three i.e Section, Unit, Quiz are draggable and can be arranged likewise. Pre required course: This is the pre requisite of doing the course i.e. if some course is selected , then that course must be finished before taking this new course. Course Forum: Link here the course with the respective course forum. Course Group: Link here the course with the respective course group. Course Completion Message: This message would be shown after the completion of the course. Course Product: After the course has been created here. The course product is made so that the course created is sold as a product in the shop. After the course product is created, we link both course as well as product with each other with the help of this setting. Excerpt: Add small two line description of the course. This appears below the name of the course. Add featured image to the course in the right hand side of this page. This image is the main image of your course which appears in the course directory, home page etc. Add categories to the course. Front End course creation and editing allows instructors to edit course contents from the front end. Almost everything which can be done from the backend can be done form the front end. 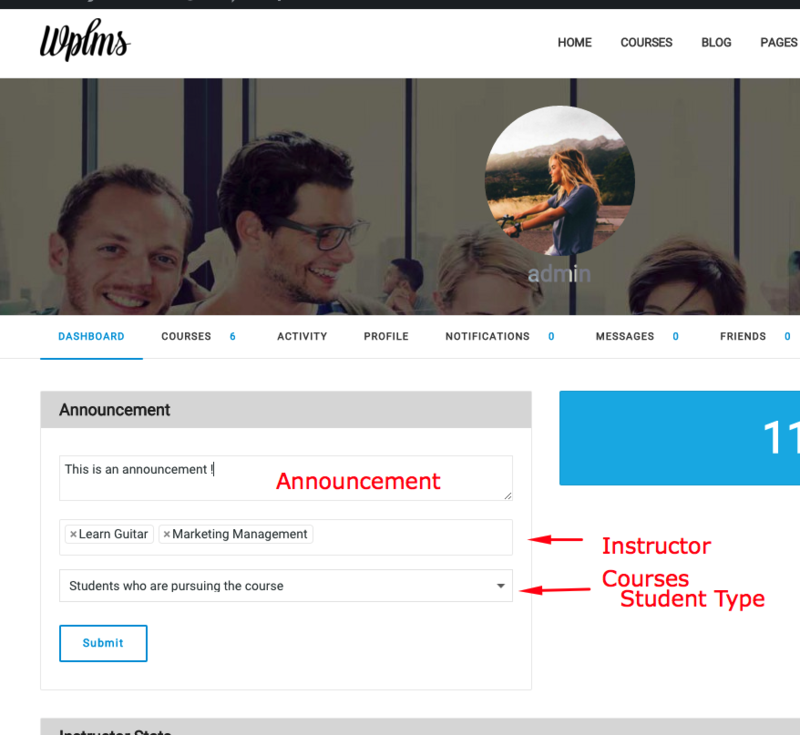 The front end course creation automatically creates and connects the necessary linkages between a course, a unit, a quiz, a product, groups and forums, thereby making course creation process a lot simpler and easier to maintain. Course Title Delete the existing test and enter a suitable title for the course. Course Category Select a Course Category, in case you want to add a new category, select new category and enter the new course category name. Course Image Select a Course thumbnail image. This image is used in course snapshot and single course page. Course Description Enter a short description of the course. This is a two line description shown below the course title. This description is also used in creating new groups and forums. The main description and content of the Course can be added later on by simply editing the course form the front end. Maximum Course Duration Maxmimum duration of course in days. Entering a value of 9999 or above shows “unlimited access” as time duration for course. Course Evaluation mode Set evaluation mode for course. Pre Required course Set a pre required course for the course. The course selected here, needs to submitted and evaluated in order to get started with this course. Drip FeedEnable Drip feed for course. Drip Duration Set Drip duration for the course. The drip duration is time period between successive units. Certificate Percentage Set percentage out of 100. If students cumulative percentage of all quizzes and assignments is more than the value set here, she will get the certificate. Badge Percentage Set percentage out of 100. If students cumulative percentage of all quizzes and assignments is more than the value set here, she will get the badge. Badge Title Add a title for the Badge. This title appears when user hovers over the badge. Badge Image Upload a Badge image. This is required to enable Badge for the course. Number of Seats Enter Number of seats for the course. The Seats comprise of students currently taking the course. Once the seats are filled, a new student would not be able to join the Course. Start Date Set a Start date of the course. If set to a future date, the Course begins when the Start date arrives, that is student will be able to join the course only after the start date. Course Group Connect a group, if creating a new course it is recommended that you create a new group for the course. By default the group created is a private group only accessible to students taking the course. Course Forum Connect a forum, if creating a new course it is recommended that you connect the group forum for the course.This will create a private group forum for the above group only accessible to students taking the course and in the group. Course Completion message Enter a Completion message, which is shown to user when the user finishes the course or submits the course for evaluation. ADD SECTION Add a new section in the curriculum. Clicking this button would add a Text box in the curriculum section. Enter the section title in the box. ADD UNIT Add a unit in the curriculum. Clicking this button would add a select box showing all the units. If instructor privacy is enabled then all the units created by instructor will be shown in the select box. To add a new unit select “Add New Unit” in the select box, which will show a input box. Enter the title of the unit in the input box and select Publish from the dropdown beside the unit. Once published the unit will be published and the dropdown controls will now show edit unit. Clicking on edit in the dropdown controls would take the user to the unit editing screen. Clicking on Delete would remove the unit from the databse. Clicking on remove will remove the unit form the curriculum. ADD QUIZ Add a Quiz in the curriculum. Clicking this button would add a select box showing all the quizzes. If instructor privacy is enabled then all the quizzes created by instructor will be shown in the select box. To add a new quiz select “Add New Quiz” in the select box, which will show a input box. Enter the title of the Quiz in the input box and select Publish from the dropdown beside the unit.Once published the quiz will be published and the dropdown controls will now show edit quiz. Clicking on edit in the dropdown controls would take the user to the quiz editing screen. Clicking on Delete would remove the quiz from the databse. Clicking on “remove” will remove the quiz form the curriculum. Save Curriculum Unless the Course curriculum is saved, the new units created and added are not a part of the course curriculum. Free Course Set the course as Free. A free is available to all students accessing the course. An Edit Course link is placed at the bottom of every course menu. This link is only visible to course instructor and administrator. Clicking this link would take the instructor to the edit course page. On clicking there is a switch to take the course offline while editing the course. When a course is offline it is not visible in Course director, search, caraousels and grids. Any student who is taking the course at the moment the course is taken offline will not be impacted by this. However, during the time course is offline she would not be able to submit the course or leave a review for the course. Units can be edited from the Course Curriculum unit controls or directly from the Edit Page control in the WP Admin bar. When the unit is in edit mode, the content can be directly added in the unit using the front end interface. Unit settings need to be saved first before clicking on update the unit content. Unit Type Select a unit type. This shows a symbol in the course curriculum corresponding to units. Make Unit Free Set a unit free. A Free unit is accessible to the world, including non-registered members and search engine bots. Duration of unit Set a suggestive duration of a unit. Only for display purpose. Connect Assignment Connect an assignment to a unit or create a new one. Connect a Forum Connect a forum with the unit or create a new one in the course forum. Quiz can be edited from the Course Curriculum Quiz controls or directly from the Edit Page control in the WP Admin bar. When the Quiz is in edit mode, the Quiz instructions content can be directly added in the unit using the front end interface. Quiz settings need to be saved first before clicking on update the unit content. Quiz Subtitle Enter a sub-title for quiz. This sub-title is shown below quiz title. Connected Course Optionally select a connected course. Once connected the quiz will show a back to course button. Quiz Duration Set a duration of the quiz. This duration sets the timer. Quiz Evaluation Set quiz evaluation mode, automatic or manual. If set to automatic make sure all question types adhere to the settings done in Options panel -> Course manager -> Auto evaluate questiont types. Quiz Completion message Set a completion message. This message is shown to the user when user submits the quiz. MANAGE QUIZ QUESTIONSUse this section to manage questions in the quiz. ADD Question Add Question using this button. A select box with questions will appear. If instructor privacy is enabled then all question created by instructor will be shown in the dropdown. Questions can be edited from the quiz timeline or by adding ?edit in the Question link. Once a question is in edit mode, it’ll show question settings. Question Type : Select the question type our of following option types. Multiple Choice Single Answer : Requies options and only one choice can be marked as answer. Correct answer is entered as a single number like 1. Or simply by clicking on the option number. Multiple Choice Multiple Answer : Requires options and multiple choices can be marked as answer. Correct answer is marked as multiple choice number saperated by comma as 1,2. Or simply by clicking on the option numbers. Add Options : Clicking on this button adds a new option with text input box. The text box acts as the option holder. Subtitle : Enter a assignment Subtitle. Assignment Maximum Marks : Enter Maximum marks for assignment. Assignment Duration : Assignment Duration in days. Assignment counter end automatically submits the assignment for evaluation. Include in Evaluation : Include this assignment in a course evaluation. If selected, marks of students in this assignment will be included in evaluation of a course. This also restricts students from viewing full assignment. Only students subscribed to the associated course can view the assignment details when they click on start assignment button and the timer starts. Assignment Course : Select a course to which the assignment should be connected. Only applicable if Include in Evaluation is set to yes. Submission type : Select submission type from Upload or Textarea. Attachment type : Select allowed Attachment types, if submission type is set to upload. After creating courses Instructor manages the courses. There are various function available to manage courses in the Theme. A course is Managed from the Admin section in Course page. After the Student has submitted the quiz. The Quiz submissions can be loacted in the Course Admin -> Submissions -> Quiz Submissions section. Evaluation screen shows, Question , marked answer, correct answer , maximum marks for the question and a textbox for marks and give marks button. To give marks to each question Instructor enters marks in the textbox and clicks save marks. As soon as this button is pressed the user gets a notification and message with the Quiz Results. After the Student has submitted the Course. The Course submissions can be loacted in the Course Admin -> Submissions -> Course Submissions section. Evaluation screen shows, the all the units in the course, and their completion status, it also shows the marks obtained in the Quizes in the course. To give marks to Instructor enters marks from 100 in the marks column and marks Course as evaluated. 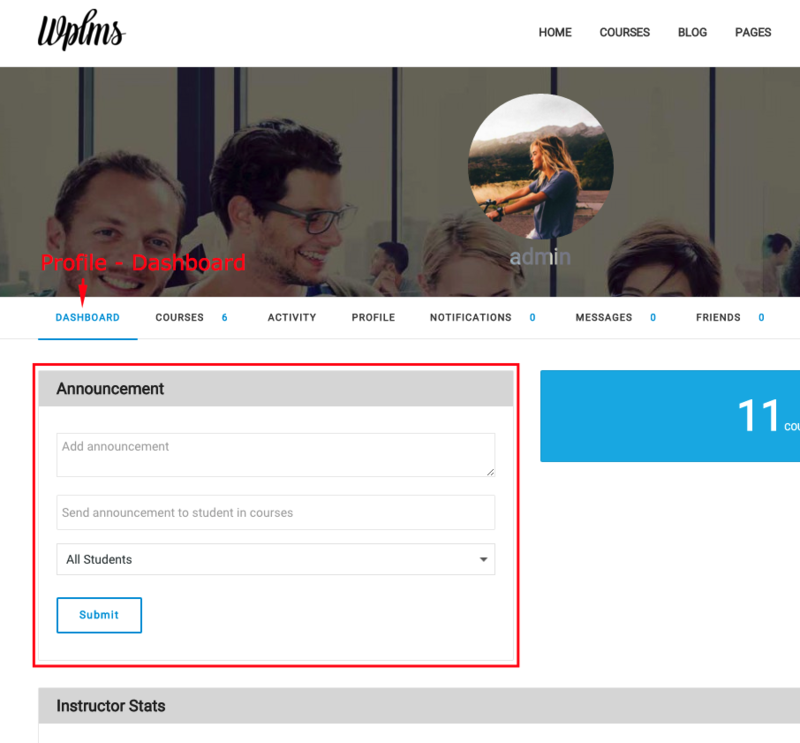 As soon as this button is pressed the user gets a notification and message with the Course Results. If the Course percentage is above Badge percentage then the user recieves a Badge, if the Course percentage is above the passing percentage then the user recieves a completion certificate. An Instructor can reset the full course for any student. The will have to start the course again from the very begining. This can be done form the Course -> Admin screen. An Instructor can remove any student from the Course. The student will have to Pruchase the course again to take the course. This can be done form the Course -> Admin screen. An Instructor can send mass message to the students taking the course.This can be done form the Course -> Admin -> Members screen. An instructor has full control over her course. Not only can see manage the course (as explained in the previous section), there are a variety of other tasks which she can achieve to run her courses. An Instructor can create announcements for her courses. The announcement is visible on the course home page and on the Student dashboard. The announcements can be added from her dashboard using the Announcement Widget. In the widget she can chose the course for which she wants to send the announcement to and she can also select the type of users to which the announcement is sent to. The type of user include : Students who have finished the course, Students who are still pursuing the course, Students who have not taken the course. The announcements can also trigger user notifications, messages or custom email using the Touch point settings in LMS – Settings. Much like a blog, every course has a news section. News can be created from backend WP Admin – LMS – Course News section. An instructor can create unlimited news in the course via this section. News can comprise of all the activities which happen in a course. This news is also avaialble in Course/News section and is also available in the Student dashboard via the Course News widget.The Course news can also trigger user notifications, messages or custom email using the Touch point settings in LMS – Settings. Instructor can set number of seats for her course. This number can be set both from backend (wp admin) or via the front end. When kept as blank or 9999 the number would simply not display in the Course Details and the Take this course Button. Note, that when an instructor manually adds a user from Course-Admin area this number does not come into play. Also if the number if changed later on it would “not” automatically remove the already subscribed users, so this setting is only applicable at the “moment” when the user is subscribing to the course. Instructor can set the start date for her course. The purpose os tart date is that the course will commence from the date provided, however users can still purchase the course. The start date is displayed in the “Take this Course” button and in the Course details area. The date can be set both from backend (wp admin) or via the front end. When kept as blank or any pre-date the setting would simply not display. The start date option is also available in course filters widget which is available in the Course Directory. If the start date if changed post user subscription it would “not” automatically remove the already subscribed users, so this setting is only applicable at the “moment” when the user is subscribing to the course. Static Drip : Every consecutive unit is accessible after X amount of time. Unit Duration Drip : Every user has to spent Unit duration time on the unit to access to the next unit. Section Static Drip : Every consecutive section (collection of units and quizzes between sections (labels)), is available after X amount of Time. Section Unit Duration Drip : Every consecutive section is available after the cumulative sum of units and quizzes included in the section. Custom Stat Date/Time for Unit accessibility. Course Reviews is a really important section for the Instructor. The instructor rating is calculated as the cumulative average of all the course ratings she has ever got.However, instructor has full control on which reviews should be displayed for her courses. The reviews are stored as comments for the course and can be approved/disapproved. The rating count and the review score is re-calculated when you edit any course review. The course cumulative rating and review count is stored in meta fields (cached) which can be changed by the instructor as well. Statistics play an important role in any LMS. Study Lab covers some of the important stats functions. We’re however open to suggestions here. An Instructor can see any User’s stats for her course only. After Clicking, if the user has finished the course, only the percentage obtained by the user is shown. 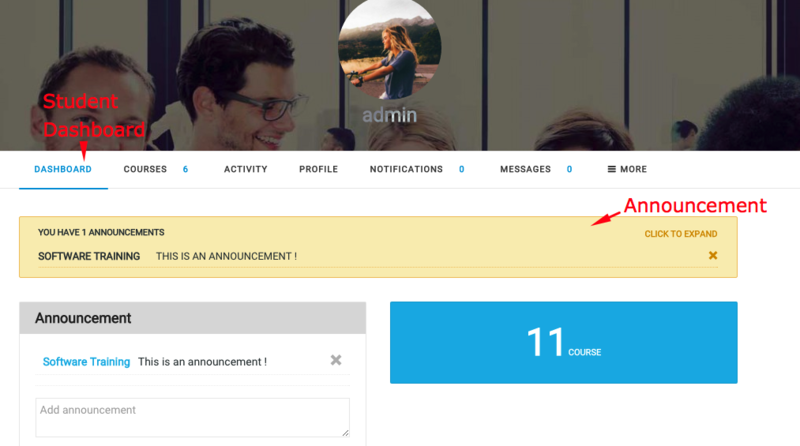 After Clicking, if the user is still taking the course then the course timeline is shown with the unit status and the marks obtained in the Quiz. An Instructor can see Course stats for her course only. Since calculating Statistics for the course is a complex process, statistics for the course needs to be manually activated by clicking the Calculate Stats icon at the bottom of the course stats screen. The Course stats then appear on the Course Stats screen. BuddyPress provides a lot of functionality for interaction among students and instructors. Every Course taker is added to the course group. There are many useful plugins which can be installed to increase the usability of Groups in LMS. The plugin Group documents enables the Instructor to upload documents, like assignments for the Course group. This is automatically sent to the full course group. With the forum Study Lab get a lot of interaction features. A Private forum conencted to the Group can be made as the Course forum. This makes the Forum an exclusive club for the Course Members. 0 responses on "Teacher / Instructor Guide"